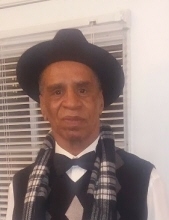 Celebrating the life of Rudolph Valentino Adams Jr.
Obituary for Rudolph Valentino Adams Jr.
Mr. Adams passed away on Thursday March 28, 2019. He is survived by his children, Jamica Adams, Shawn Williams; siblings, Anthony Adams, Mark Adams, Alma Payne, Genia Adams-Burton; grandchildren, Kamden, Karter, Jaylen and former spouse Marian "Tina" Williams-Adams and a host of nieces, nephews, cousins and friends. His memorial service will be held on Wed. April 3, 2019 at 11AM, with visitation starting at 10AM, both held here in the chapel. To send flowers or a remembrance gift to the family of Rudolph Valentino Adams Jr., please visit our Tribute Store. "Email Address" would like to share the life celebration of Rudolph Valentino Adams Jr.. Click on the "link" to go to share a favorite memory or leave a condolence message for the family.